Firefighters from the Flanders Fire Company No. 1 and Rescue Squad Extinguish Blaze Before It Can Spread Throughout Home. Firefighters are credited with a "quick knockdown" of a fire in this home. 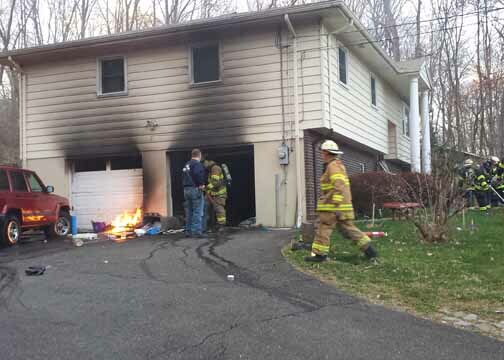 FLANDERS, N.J. - April 29, 2015 - PRLog -- Two people were injured in a house fire yesterday evening on Route 206 in Flanders, a section of Mount Olive Township. Police (http://www.mopd.org/) and firefighters (http://www.flanders-fire-rescue.org/) in Mount Olive were notified of a structure fire with possible entrapment around 7 p.m. last night. Police Officer George Jadue was among the first to arrive at the two-story, wood-frame home, which is set back from the road. Jadue was met by two off-duty New Jersey State Police troopers, who told Jadue a woman was inside the home. When the trio tried to enter the home, heavy smoke drove them back. They called to her and guided her to the stairs, where she was able to jump to the law enforcement officers, who pulled her to safety. Jadue and the resident were both transported by emergency medical technicians from the Flanders Fire Company #1 and Rescue Squad and the Budd Lake First Aid Squad to local hospitals for smoke inhalation and other minor injuries. They were treated and released. Because the fire company was involved in the resident’s treatment, federal privacy laws prohibit the fire company from releasing her name or other information about her. Meanwhile, firefighters from the Flanders Fire Company #1 and Rescue Squad and from the Budd Lake Fire Company arrived and found heavy fire coming from the garage area. Firefighters made entry to the garage and quickly doused the fire. Fire Chief Michael McDermott said firefighters were able to prevent the fire from spreading significantly into the main part of the home, although there was smoke damage in the house. Route 206 was closed for a short time because firefighters stretched a water supply hose from a hydrant across the street from the home to apparatus in the long driveway. “It was a good stop and a quick knock down,” said McDermott. The chief said firefighters also need to clear the home of smoke and high levels of carbon monoxide. The fire is the latest in a string of unrelated fires that has hit buildings in Budd Lake and Flanders. Mount Olive firefighters received help from departments in Chester, Hackettstown, Netcong and Roxbury. The fire is under investigation by the Mount Olive Fire Marshal’s office, the Mount Olive Police Department Detective Bureau and by Morris County authorities. The Flanders Fire Company No. 1 and Rescue Squad provides fire protection and emergency medical services to residents and businesses in Flanders and, through mutual aid, surrounding towns. It is made up of about 45 members who receive training in fire suppression, rescue, hazardous materials response, homeland security issues and emergency medical services. The fire company operates two fire engines, one tower truck, one heavy rescue, a brush-and-foam truck, three ambulances, a multiple-casualty unit and a mass decontamination unit. In addition, the fire company offers public education services including lectures, demonstrations, training and a trailer that safely simulates a smoke-filled home. For information about membership, donations or public education, call (973) 584-7805 or click on www.flandersfire.org.